We have officially said goodbye to summer with the cooling temperatures and bright, yellow and red leaves falling from the trees. Indeed, we are surrounded by beauty this time of year. You should kick off the fall season by filling your kitchen with all sorts of wonderful autumn goods. There is a long list of seasonal treasures fall has to offer. Autumn is harvest time for some of our favorite foods. Fruits such as apples and pears are ripe and ready to pick. Pumpkins are orange and plump and wild mushrooms are hidden under a carpet of leaves. 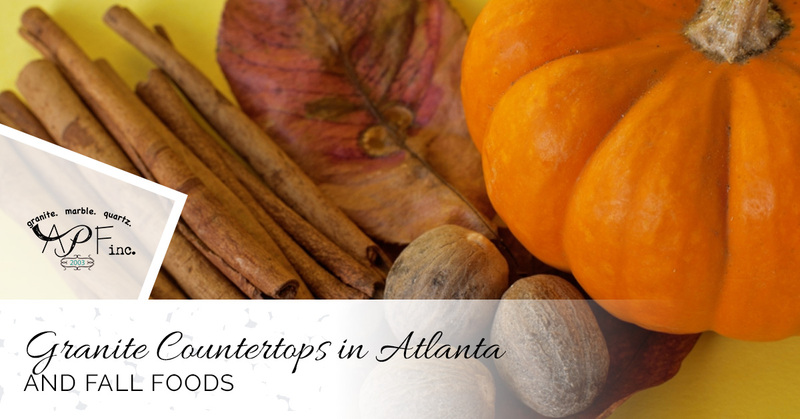 A Polished Finish, your source for granite countertops in Atlanta, offer you this list of fabulous fall foods. Cranberries are much more than a staple at Christmas and Thanksgiving dinners, simmer them with a bit of water, sugar, orange zest and a cinnamon stick to make a delectable compote to pour over ice cream or top a slice of vanilla cheesecake. Chestnuts offer a taste that is subtle in sweetness, which makes them a great addition to savory dishes. Chop up a few chestnuts and add them to your favorite risotto recipe. In addition to adding a stunning appearance when used as a garnish, pomegranates hold a number of health benefits. You can pair them with a roasted eggplant or sprinkle them over a fruit salad. This is the best time of year to enjoy wild mushrooms. You only need a few to give almost any dish an earthy flavor. Try wild mushrooms in an omelet or add a slice or two to your morning avocado toast. Cabbage is delicious in stews and soups. Pumpkins are more than just Halloween decor. You can cube them, roast them and add them to a hearty fall salad with feta and Parmesan cheese. The rich pumpkin flavor makes your risotto even better. Pears are peaking right now and can be added to savory and sweet dishes. Try slicing a few up and adding them to your pork dish. Diced pears also taste very good on your morning oatmeal. These tasty beauties are the most flavorful in the fall. They are rich in beta-carotene, which can prevent vitamin A deficiencies, they promote good eyesight and are a great source of vitamin C. You can even eat them without peeling them. Try a new take on the classic frittata by combining sweet potatoes, kale and goat cheese in the recipe. Squash is one of the poster foods for fall. Spaghetti squash is fun with its pasta-like strands. Like sweet potatoes, squash is rich in beta-carotene. Ease into fall with a curried butternut squash stew that you can make in your slow-cooker. The family will love it. These root veggies won’t win any beauty prizes, but what they lack in looks they more than make up for in flavor and nutrition. Research suggests turnips help reduce the risk of lung and prostate cancer and are a good source of calcium. You can find beets almost any time of the year, but they are best in the fall. You are probably familiar with the deep red beets, but you can also find white, golden and even multicolored beets. Research shows that beets contain a compound that helps prevent liver and heart disease. These crunchy and sweet Autumn favorites are packed with antioxidants, which helps slow the aging process and prevent chronic illness. There are over 7,500 different types of apples for you to choose from. You can use them in your favorite fall recopies or make them into pies or jams. Apples go very well with roasted chicken for a Sunday dinner. The parsnip is a root vegetable that belongs to the family of carrots. They are rich in vitamin A, calcium and iron and offer a sweet and delicate flavor you can add to soups and salads. Kale is readily available in the fall and is sought after due to its long list of health benefits. Cinnamon is one of the oldest known spices and it is essential in fall recipes. Celebrate fall with these lovely foods and by investing in granite countertops for your kitchen from A Polished Finish.